Yesterday, Apple released its new iPhone 5 along with updated versions of the iTouch and Nano iPods. Although I was very excited about the release of these new gadgets (none of which I actually NEED), I thought back to the time a few months ago when Apple pulled their green certification from their production and products. Apple did return to their certification, but does this mean they are more green? Manufacturing: Over the years, Apple has worked to decrease material use (in general) and toxic substances such as lead, BFRs (brominated flame retardants), PVCs, Mercury, and Arsenic. They have also worked hard to increase the use of environmentally conscious materials like recycled plastics, recycled paper, and vegetable-based inks. They also use recycled materials in their distributions of iTunes gift cards and packaging. Transportation: Apple has been using less greenhouse gases in their transportation. 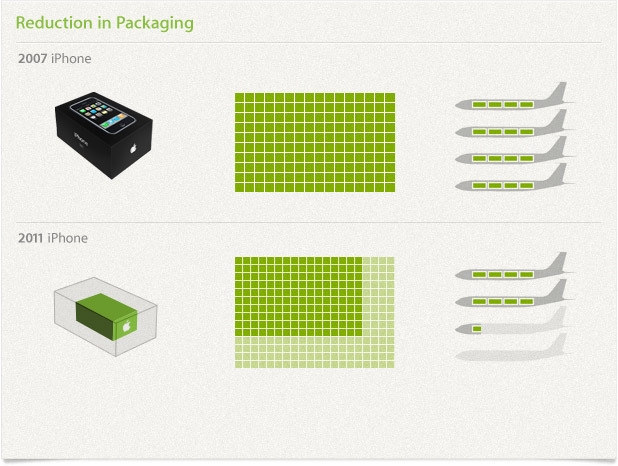 Reduced size of packaging allows more items to be shipped at the same time, which uses less gas. 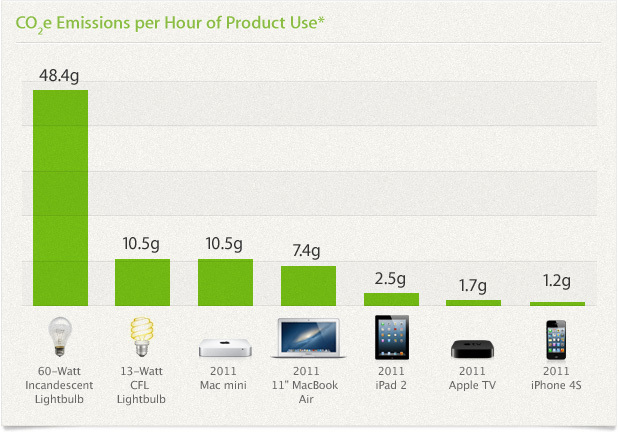 Product Use: Apple also makes their devices as energy-efficient as possible in order to conserve power. Below is a graph of energy use with different devices compared to a lightbulb. Recycling: They try to reduce landfill waste by making their products longer-lasting. Also, Apple collects it’s waste and used electronics and recycles them responsibly. They have diverted more than 115,000 metric tons of waste from landfills since 1994, and the numbers increase every year. Below is a graph of their recycling habits. Facilities: Last but not least, Apple is also focused on reducing energy use in their facilities. only 2% of their greenhouse gas usage is taken up by retail stores, corporate offices, distribution hubs, and data centers, which is admirable considering how much time we spend in these stores and how many devices Apple sells. To learn more, you can read the Environmental FAQs on Apple’s website. All in all, it seems as if Apple has changed their ways, diverting from their green certification drop a few months ago. It is great to see that a company as huge as Apple is releasing records to the public and allowing us to judge them ourselves. Hopefully this re-vamp of environmental positivity will make Apple feel good about their company and prevent a drop of certification in the future.